Moving along the life of Julie Barenson, a 29 year old widow, The Guardian by Nicholas Sparks is an exhilarating, dark, romantic thriller. 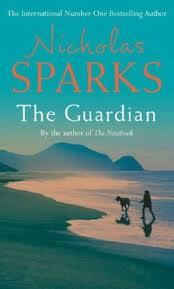 While Sparks is known for writing sappy love stories that pull on the reader's heartstrings, The Guardian comes as a surprise, and is undoubtedly one of his finest works. Julie loses her husband Jim to cancer, and is widowed at the young age of 25. She’s left with only his memories and an outdated letter that comes with a pre-planned Christmas gift by Jim – a Great Dane puppy. Jim’s promise to guard over her forever consoles the broken Julie and soon, Singer, the ever-loyal dog with a funny human-like nature, becomes an integral part of her life. Nearing her thirties, Julie decides to move on. But who’ll be her rock? Will her next man be Richard Franklin, the “sophisticated, handsome” engineer, for whom Julie seems to be the world, or Mike Harris, the “down-to-earth nice guy” who was her husband’s best friend? While the reader expects a “happily-ever-after” line after Julie makes her choice, we soon find her fighting for her life and new-found love. The murderous battle, spawned by deception and a poisonous jealousy, captures the interest of the reader with its electrifying intensity and suspense.